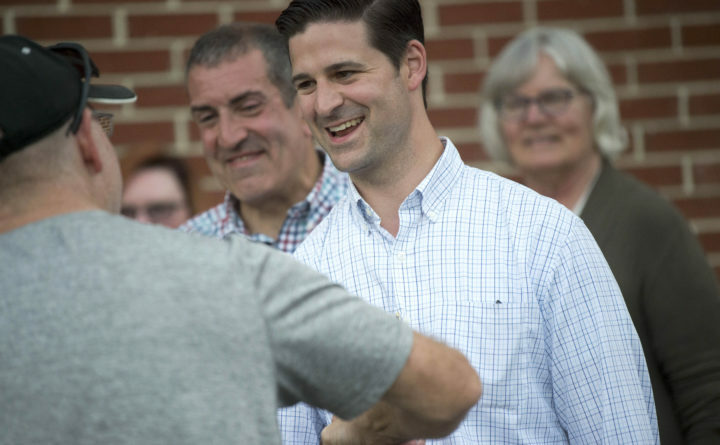 This photo taken June 12, 2018, shows Waterville Mayor Nick Isgro shaking hands with voters as they enter the Alfond Athletic Center at Thomas College during primary voting. Voters in Waterville on Tuesday appeared to pass a measure that would ban the use of plastic shopping bags at large retailers in the city, but Mayor Nick Isgro, a vocal opponent of the ban, said the results will be challenged. Isgro, a Republican, also said in a Facebook post Wednesday that a City Council race apparently won by a Democrat by just four votes will be challenged. The plastic bag ban passed by less than 150 votes out of nearly 6,000 cast — 3,052 in favor, 2,906 against, according to unofficial vote counts submitted to the Bangor Daily News. In Ward 1, Democrat Michael Morris appeared to defeat Republican Catherine Weeks, 346-342. In a separate post before the election, Isgro claimed a “hate mob” of Democratic college students were distributing “smear flyers” in a campaign against Weeks. Isgro, an outspoken conservative who narrowly survived a recall vote in June after a social media post about a school shooting survivor many found offensive, celebrated the election of Libertarian Jay Coelho in the council’s Ward 5 race, however. “I am very pleased that the taxpaying residents of Waterville gained representation from everyday folks while the political elites lost ground,” said the mayor in his post, in part. Waterville City Clerk Patti Dubois told the Morning Sentinel that 149 absentee ballots cast by Colby College students were challenged by Republican House candidate Mark Andre, who argued the student housing addresses used don’t meet voter registration guidelines. The newspaper reported that the students’ ballots would count in either Ward 3 or Ward 6, however, so a challenge to those votes would not affect the Ward 1 results. In the Ward 3 council race, Margaret Smith convincingly defeated Robert Patterson, 626-240. There was no Ward 6 race. The only other council race was in Ward 7, where Erik Thomas won a four-way race for a four-year term. The proposed bag ordinance would block stores larger than 10,000 square feet from distributing plastic shopping bags, like those commonly used in checkout lines.